Pignut is a forager’s favourite, but not easy to grow. However, it has a number of pluses that make some perseverance and experimentation seem worthwhile. So what are pignuts? 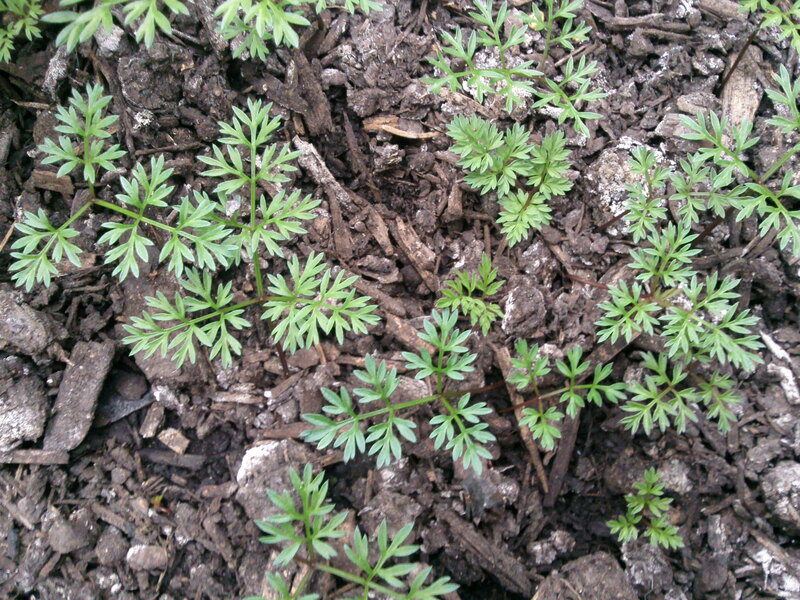 Well, to science they are known as Conopodium majus, yet another member of the sprawling Carrot Family or Apiaceae. To generations of small boys and girls, they are known as the free treat you get if you painstakingly dig down where you see the distinctive leaves. Just recently they seem to have become a fashionable ingredient, starring in some seriously foodie recipes by chefs like Hugh Fearnley-Whittingstall. Pignuts have a lot of promise as a forest garden crop: they are extremely shade tolerant; they produce a starchy tuber, which is a bit of a gap in the forest garden repertoire; and they have a very pleasant taste and texture, a bit like a cross between a chestnut and a hazelnut. Unfortunately they also have several drawbacks, which I guess are what have so far prevented them from being domesticated like so many of their cousins. The first is their life cycle. This isn’t a crop you sow in spring and harvest in autumn. In their first year of growth, they resolutely refuse to produce more than a single pair of leaves (technically the seed leaves or cotyledons, the ones which were always there, curled up inside the seed) even if growth conditions are perfect. At the end of the season they produce a tiny little overwintering structure called a corm, so small that you wonder what the fuss was about. The next year the plant throws up true leaves in about March but it may still take a few years for the corm to grow to a size worth bothering with. The second problem is that pignuts like to bury their corms deep and then grow delicate, thread-like shoots up to the surface, making the harvesting of them quite an art. I think this is what makes them appeal to foragers, who are after all in it for the challenge as much as for the food. Then there is the yield. The genius of pignut is that it can eke out a living, slowly increasing in a hostile tangle of other plants or in unpromising conditions. The drawback is that given a clear field and perfect conditions, it sticks determinedly to its slow and steady strategy. So the good news is that if you get pignuts established in your garden, they will never need any attention again and you can occasionally dig up a pleasant treat. However, I can’t help thinking that a bit of selective breeding might produce something far more useful than this, getting round the difficulties but keeping the strengths. I’m currently growing a container full of pignuts, selecting for the size and shallowness of the corms. Since they take a couple of years to come to seed I haven’t had a lot of generations yet and can’t report any results so far, but watch this space. The other possibility is that they could be cultivated in a way that gets round the limitations. 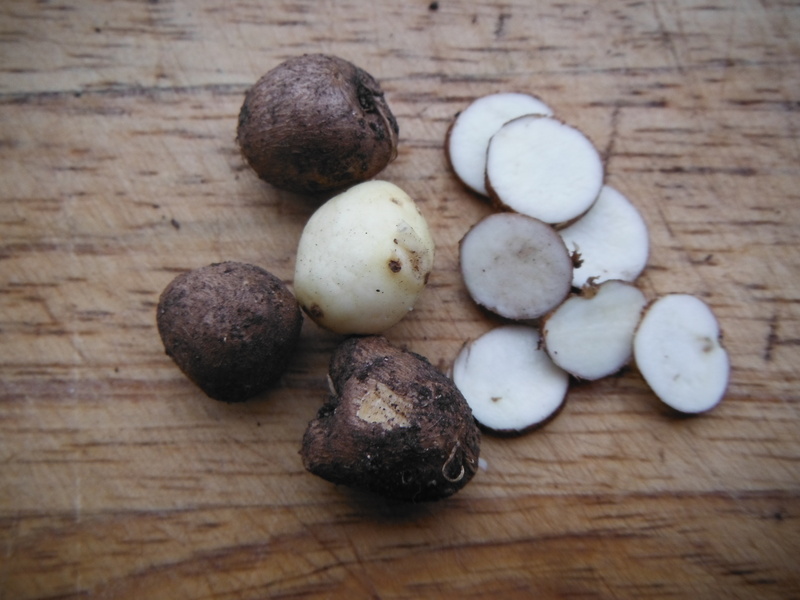 Potatoes suffer a lot of the same problems, for instance, so we don’t usually bother growing them from seed (although you can: it’s quite easy and good fun) but instead just save a few tubers and replant them instead. It isn’t clear that the same is possible with pignut though. 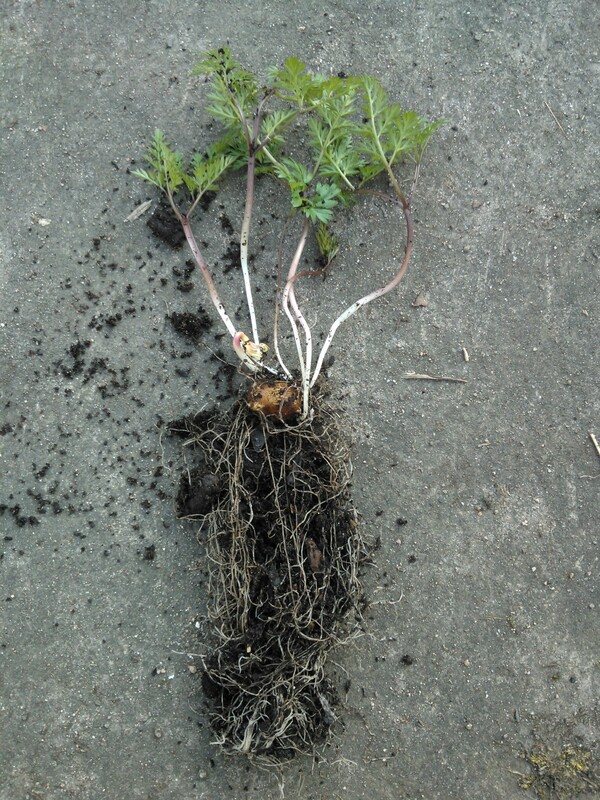 Instead of producing many tubers from one every year, it makes one corm, larger every year. I’ve experimented with cutting them into pieces, as you can do with potatoes, but they don’t seem to survive the process, and while potatoes hve many ‘eyes’ or growing points, pignuts have only one or a few. A more promising line of experimentation seems to be to grow pignuts in a way better suited to their first-year growth habits. Instead of sowing out seed and having to weed the resolutely tiny plants, I sow them thickly in a tub of compost in autumn, then more or less forget about them for the next 18 months. In this time, they produce a mass of what I think of as ‘seed corms’ which can be sieved out of the compost and then sown almost as you would sow seed. An added advantage to this is that the corms stay where you sow them without getting any deeper, making them much easier to harvest. Even grown like this, I don’t think pignut has the makings of a major crop just yet, but with enough selective breeding, who knows? This entry was posted in Plant breeding, Species and tagged Conopodium majus, forest garden, perennial vegetables, pignut, unusual foods. Bookmark the permalink. An excellent project which I’ve been meaning to start myself, but can’t get the darn things out of the ground. Perhaps you don’t need to. I find it a lot simpler to collect the seed and then grow it on in tubs of compost which the corms are much easier to retrieve from. Interesting. I’ve never come across any varieties of it. Do you have any more detail than that? Interesting article, thanks for sharing. Have you grown the similar related plant earth-chestnut (bunium bulbocastanum)? I was thinking to grow them and wondered if you had any experience with them. A bonus with the earth-chestnuts is the seed is supposed to be quite tasty too so at least you get something while you wait for the tubers to form. I’ve tried but it doesn’t seem too well adapted to conditions here and its hard to get good stock. Seed I’ve bought hasn’t germinated. One plant planted outside emerged very early and was killed by frost. One kept inside emerged even earlier and then died back. A third one grew well and I got excited – until I realised it was actually an entirely different plant! I see you wrote this 6 years ago now… How is the selective cultivation going? Not very well! It ground to a halt three years ago when I hurt my back and couldn’t do so much, and I lost some of my seed lines. I have a patch still growing in the garden and collected a little seed this year, but I’m more-or-less resigned to it being a very minor component of the forest garden now. I wish I had realised when I named the blog!